on Amazon.. and since then I have been hooked on slicing all the veggies I can think of! 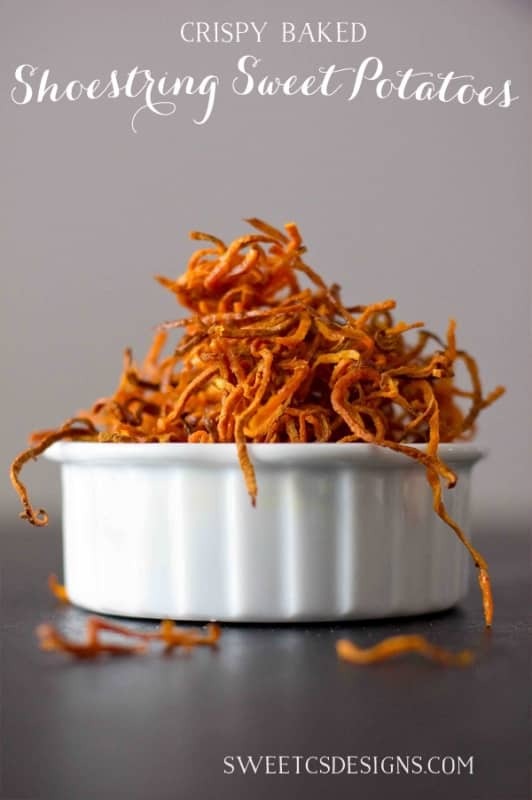 Today I am showing my favorite new snack (and baby B’s new favorite)- Crispy Baked Shoestring Potato Fries! These are so delicious, so easy to make, and take less than 30 minutes, start to finish. They are crunchy, slightly sweet, a little salty, and you won’t be able to stop eating them! But who cares, it works on most low carb diets and is FAR healthier than french fries! The number one thing to remember when making these is that you need to cut your sweet potatoes so that it has a flat surface on both sides. If you don’t, the slicer won’t grab the potato well and can slip and slide off the prongs. If you slice it so there are two flat sides on each end, it will work fabulously! Also be sure to push down on the slicer. It has gentile suction cups that keep it from moving all over your table or workspace. GENIUS! I hope you love snacking on these crunchy fries as much as my family does- they are so good! AND good for you!! Slice the ends of your sweet potatoes to be a flat surface. Put one end of the sweet potato on the small sliced prong, and the other end on the spiky fingers. Slowly crank the slicer, it will slice the potato as you crank! I like to crank the slicer right over a baking sheet so there is no cleanup. Discard the small core of the sweet potato. Toss slices of potato in olive oil and sprinkle with celtic sea salt. Bake for 25 minutes, or until crispy. Tried this as well. I’m in the camp of “it’s tricky to bake them right”. Maybe just used too much olive oil? It took me at least 40-45 minutes to get them right, including some broiling action. However once they were done they were great! It just takes a lot of work and attention for a relatively small batch. Tried mine with come cayenne and garlic salt. would an apple peeler work just as well? Yes- but I’m lazy so I like the spiralizer because it makes quick work 🙂 a mandoline works well too. Very excited to try this recipe. 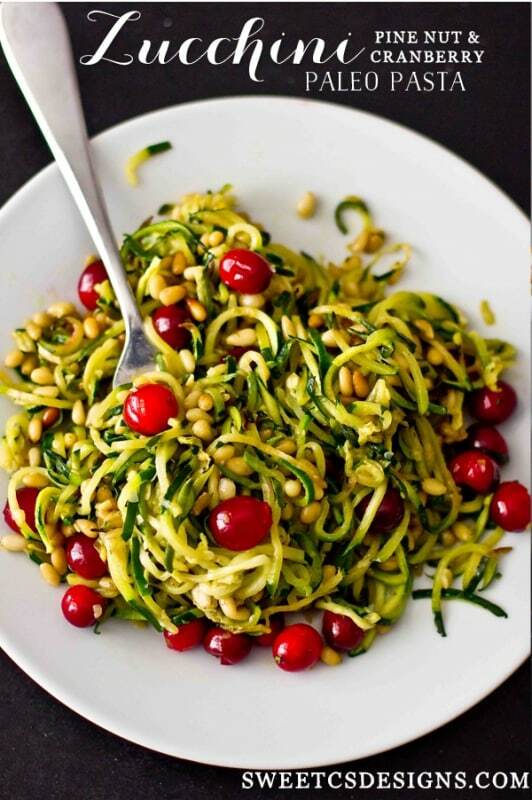 This will be the first zoodles I make I just bought a spiralizer. Is the sweet potato raw when you spiralize it? It took mine a bit over 30 minutes to just start to get crispy, and a couple of minutes after that many of them around the edges were burned. Guess it’s a recipe where you have to watch the pan carefully. (I did also use refined coconut oil since it’s more stable at higher heats.) The ones that I managed to get off the pan still orange were delicious. I did use the smallest slicer. Because all ovens can be different, I suggest watching them pretty closely. You might also have to toss them while baking to help prevent burning. I know in my old oven I got weird hot spots, so I had to stir them more often. I feel like mine always burn when I make them. Any tips? If they are burning, I’d bake them a bit longer at a lower temperature and then just quickly broil them to make them crunchy. Since all ovens are different, you might need to adjust it. Made them last night! They’re a hit! My mom gifted me one of those handy contraptions last summer and I haven’t used it enough – this recipe will ensure I use it often!! I just made these tonight and they were so good! also to chime in on the convo above i just cooked my odd bits of sweet potato that weren’t spiralized in the same pan on the side, they tasted good too 🙂 Finally a way to get crispy sweet potato fries! I have been trying to justify buying one of these-you just sealed the deal. Hope you keep adding new recipes. These look amazing and crispy! I’m definitely going to try them! I feed the leftover sweet potato to my dog–he LOVES sweet potatoes! I love my Spirooli and have been making sweet potato fries for a while. However, after much use it broke and was replaced immediately with another one. It turns out that the newer models are made of very cheap plastic and don’t hold up well to the sweet potato and it broke. We contacted the seller and he gave us our money back, but I would have preferred having a Spirooli that worked!!! Have you discovered a heavy duty model that holds up to the sweet potato and other hard roots? I use a Paderno Slicer- no issues so far! These look amazing!! I’ll have to look into that slicer! I made these today 🙂 I have the same slicer and it was my first time using it! Mine tended to come out in more band like spirals, as if it wasnt completely separating them. I could pull them apart by hand but they wernt like yours :/ Is there any tricks or ideas you have for best placement, potato size, cranking technique? I just did them again tonight with purple sweet potatoes. They were long like band spirals- I just cooked them a bit longer and added a bit more olive oil and it made them so crunchy it just broke apart for my kids. Also, I found if you push harder, you’ll get a bit of a thicker fry (which I like), and if the potato is slightly off center you’ll get them to be more like arcs than a spiral. 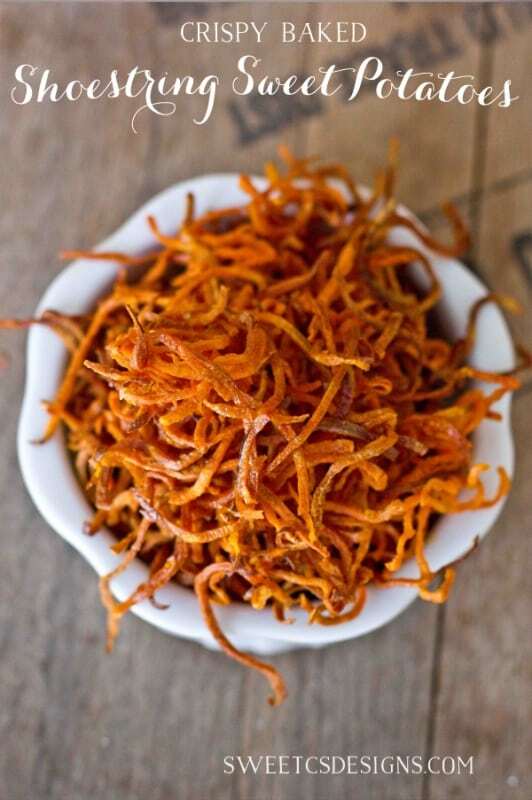 Those shoestring sweet potato fries stopped me in my tracks on Foodgawker. Pinned to my “exceptional vegetable” Pinterest board. I’m going to make these very soon. I plan to by the veggie slicer right away. Thanks for the great recipe! These look so so good! 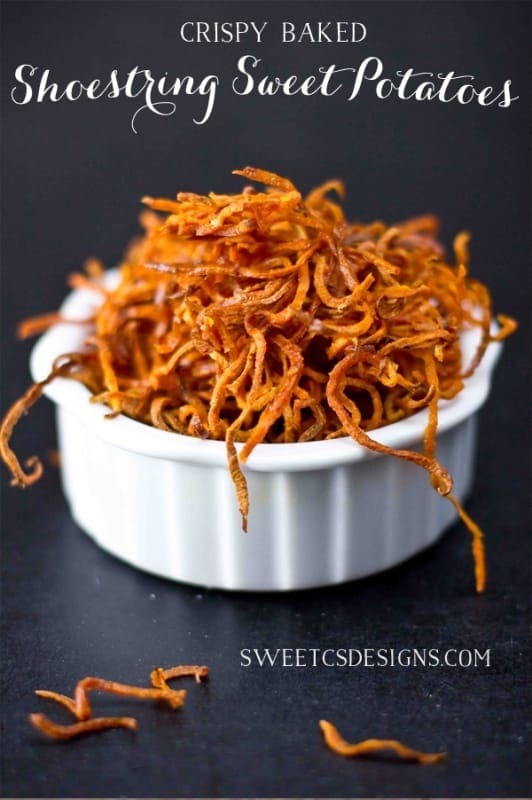 I love sweet potato fries, and these look even better!!!! That slicer is going on my Amazon wish list right now. Those look amazing! Thanks for sharing! Dawn- stay tuned because I am working on a post right now that is AMAZING with it! I do plan on making these soon but I have to buy a potato slicer. I might be able to use my Kitchen Aid. 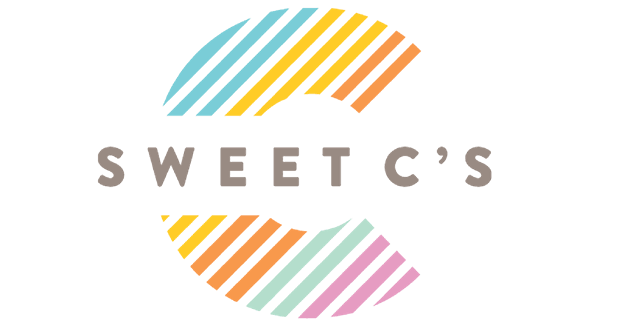 I cringed when you said discard the core of the sweet potato. Why not throw them in the freezer until you have enough and then cook them another way?